We strive to get orders out quickly so you can enjoy your purchase ASAP! We process orders Mon-Fri 9 am - 5 pm. If an order is placed after hours, or on a weekend, the order will be processed on the next business day. Please see the shop's calendar for observed holiday closings. Shipping time varies by location and is also based on the United States Postal Services' holiday observance. For International shipments, USPS does not track First Class and Flat Rate Envelopes once they leave the US. Neither delivery confirmation or insurance is available. Tracking is available on the Medium Flat Rate Box and Large Flat Rate Box. Our goal is 100% customer satisfaction. We have a 30 day return policy on items you aren't satisfied with. Refunds will be issued once items are returned to us. The items must be in the same condition and packaging you received them in, with no signs of use or odor. Sale items may not be returned. Due to copyright laws, patterns and books may not be returned. Shipping charges are the responsibility of the buyer. 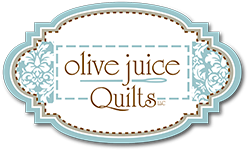 All information collected by Olive Juice Quilts, LLC will be kept confidential and used for the manner intended (i.e. contacting you with questions regarding your order). We do not share or sell any information with any outside parties. We ship everything via USPS Priority Mail. Shipping charges are based on total dollar amount before tax, if applicable. Any customs, duties or taxes are the responsibility of the customer. All returns on notions, and kits (un-opened), must be accompanied by a receipt for refund within 30 days of sale. Any return without a receipt will receive in-store credit. Fabric Yardage, books, and pattern sales are final.